Groups of visitors delve into music and words on this large-format interactive table to explore the diversity of the musical landscape and the interconnections between musical genres. This 19-foot interactive table unfolds the musical landscape for visitors in an elegant, intuitive interface alive with music and sound visualizations. Stepping up to the table, which consists of an interactive surface, in eight segments, that can accommodate up to 20 listeners through headphones and earbud jacks, visitors first experience a unique 13-minute soundtrack—a melding of diverse songs—as they view a flowing stream of genre names that make up the main navigational element. As visitors select genres, images of key artists or cultural events and excerpts of representative songs, in addition to detailed descriptions of the genre, allow visitors to gain a sense of the character of each genre they browse. 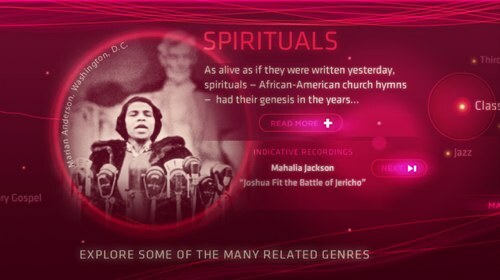 The interrelations among musical forms within this range of musical diversity are brought into focus with animations that highlight related genres, or “crossovers.” Rich content for over 150 genres is right at visitors’ fingertips in this fluid, continuous experience that is both an opportunity for learning about new genres and enjoying music.